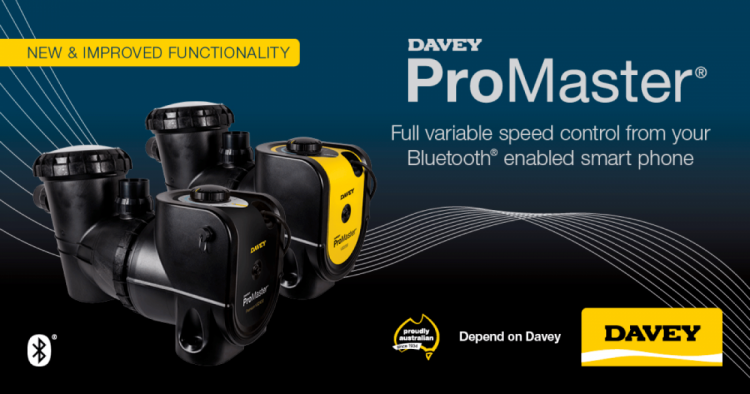 The range of Davey energy efficient variable speed pool pumps has been upgraded to include app control via Bluetooth connectivity. Briefly, the pump can be controlled via 2 modes in the app. A settings mode is also available which allows you to adjust the priming speed between 5 and 10 each time the pool pump starts and runs through the initial priming. You are also able to set 2 independent backwash speeds to allow ‘pulsing’ between the two-speed settings. The Promaster App is supported on Apple IOS and Android devices (insert logos) and can be found by searching for “Davey Pool Pump”. No customer registration is required to connect the app to the pool pump, you simply ‘search’ and ‘pair’ the pool pump to your device. The app can be installed on multiple devices, but only one device can control the pump at any given time.